A closer look at musical artifacts found in the archive. 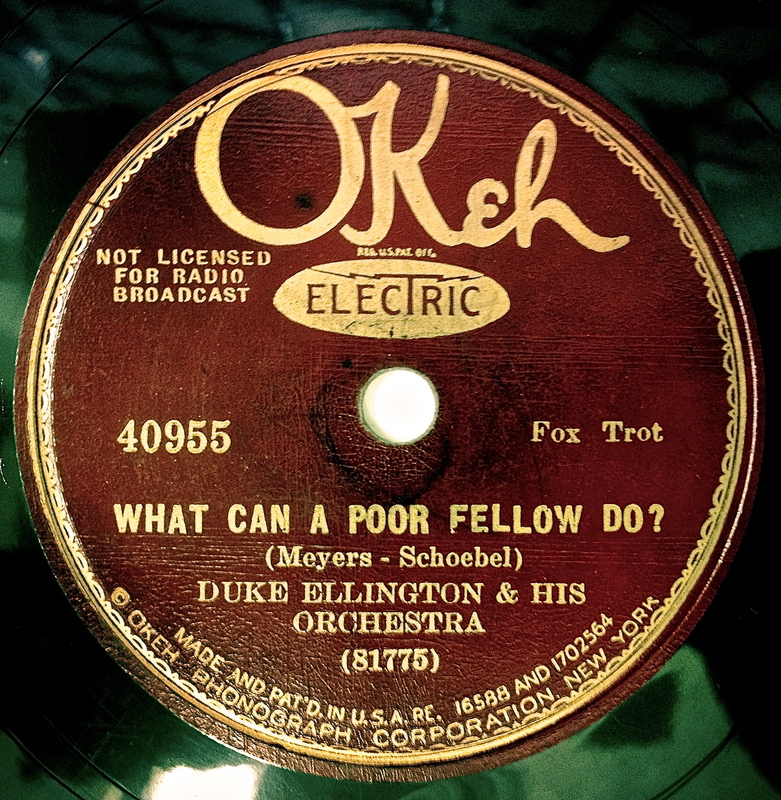 78: “Black and Tan Fantasy” b/w “What Can a Poor Fellow Do?” by Duke Ellington & His Orchestra. Okeh 40955. Recorded 11/03/27 in New York City. Image courtesy of The Rodgers & Hammerstein Archive of Recorded Sound. Anyone out there expecting a comprehensive, biographical take on Duke Ellington from me can forget it. I’d have no time to listen to music or make music if I were to attempt to do the man justice, and it’s hard enough getting people to read a 1,000 word blogpost, let alone a 1,000 page blogpost. Big fans of Ellington’s who happen to read this will, understandably, be disappointed by the glaring omissions—both canonical and those subject to personal taste. Righteous anger at the seemingly inaccurate way another person describes a favorite musician or songwriter is, of course, a sign of love for the person being described. With that in mind, a brief biography: Edward Kennedy “Duke” Ellington was born in Washington, D.C. in 1899. His parents were both pianists, and he started taking lessons at the age of seven, though baseball was of greater interest at the time. Apparently, President Teddy Roosevelt used to pass by on his horse and watch Duke and his friends play. He took music more seriously in his teens and was leading bands in D.C. and Virginia by his early twenties, playing to both black and white audiences, which was pretty unusual at that time. He soon moved to New York City and took the coveted Cotton Club house band engagement when King Oliver turned it down, and the exposure from the club’s radio show helped introduce him to the rest of America. He was a master at making three minute songs—that’s as much as a 78 side would generally allow—as tonally and structurally sophisticated as possible. That knowledge would pay off years later when LPs allowed for more ambitious pieces. Ellington continued to make music into the 1970’s, just before his death. Over the course of over 50 years of recordings and performances he stretched the boundaries of popular music and blurred the lines between swing, bop, and even classical music. He rightly believed that jazz was a limiting descriptor, and he preferred that his work simply be referred to as American music. Fair enough. So. The disc in question was released in 1928, hot on the heels of Duke’s first big hit, “Creole Love Call.” That one proved to be a big hit for collaborator Adelaide Hall, as well. Tagged Adelaide Hall, Alvin Ailey, Bessie Dudley, Black and Tan Fantasy, Bubber Miley, Cootie Williams, Creole Love Call, Duke Ellington, Florence Hill, In a Sentimental Mood, It Don’t Mean a Thing (If It Ain’t Got That Swing), Ivie Anderson, Joe "Tricky Sam" Newton, John Coltrane, King Oliver, Louie Bellson, Mood Indigo, Okeh 40955, Ray Nance, Sonny Greer, Stevie Wonder, Teddy Roosevelt, The Cotton Club, What Can a Poor Fellow Do? “Three Ball Blues” b/w “Blue and Worried Man” by Blind Boy Fuller. Okeh 05540. Recorded 04/06/40 & 04/05/40 in New York City. “Ceremony” b/w “In a Lonely Place” by New Order. Factory 33. Recorded 1/22/81 in Manchester, U.K.
“Je Finirai Par L’oublier” b/w “Milisse Mou” by Nana Mouskouri. Fontana 6010 066. Recorded in France, 1972. “Last Mile Blues” b/w “I Can’t Quit That Man” by Ida Cox and her All-Star Orchestra. Okeh 6405. Recorded in New York City, 12/20/40. “She Loves You” b/w “I’ll Get You” by The Beatles. Swan S-4152. Recorded July 1, 1963 in London, UK.